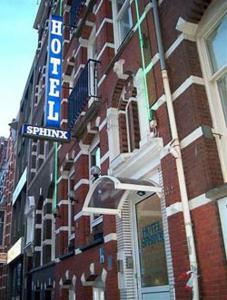 Sphinx Hotel, Amsterdam discount hotels and accommodation. The Sphinx Hotel is situated in the centre of Amsterdam, surrounded by shopping areas, streetmarket, second-hand market, flowermarket and entertainment centres like Leidseplein and Rembrandtplein. Rijksmuseum and Van Goghmuseum are nearby and around the corner you will find the Heineken Brewery. Everything is within walking distance. The Weteringcircuit is one minute away with tram stops for lines 6, 7 and 10. Trams 16, 24 and 25 will take you directly to Central Station in 10 minutes. Line 4 takes you to the RAI Exhibition Centre within 15 minutes. View photos, room descriptions and make online reservations at Sphinx Hotel. Save on room prices at Sphinx Hotel, Amsterdam.